First, I'm a committed follower of Jesus Christ. He paid my debt and gave me true life. This shapes my world view and my decision-making. I've spent a fair number of years in business and strive for success, but I'm absolutely confident it's not the most important thing. Second, I'm a boring, usually-introverted family man. I have found a truly good thing in my wife Jana and have had my heart and my house filled with 4 beautiful, rowdy children Audrey (8), Cole (6), Norah (4) and Grayson (1). I have no hobbies, no toys, and no desire to spend more than a little time away from my home. The Lord has been kind to me, and I am content. 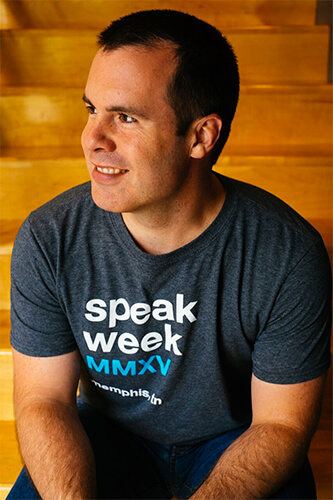 Beyond those things, I'm the owner and president of Speak Creative, a Tennessee-based digital agency with offices in Memphis in Nashville. I've experienced and learned a lot in my 17 year journey. While there's certainly no shortage of books and bloggers discussing business topics and leadership theory, I felt there was a story not often told: the perspective of leading a small business day to day. My hope is that I can bring some understanding to other entrepreneurs and team leaders out there who are facing the same challenges. I also want to help employees have a glimpse into life on the other side of the desk so you might understand why you think your boss is crazy. I'm here to be a resource to you, so don't hesitate to contact me if you have a question or would like me to address a specific topic. That's about it. Time to write some blogs.